“We can take the same school [Eastwood] and put it up at University [High, on Baker’s Ridge Road],” he said. Recall: this (new) UHS site is NOT one of the 19 sites that Mon Schools investigated and considered via their hired architect, who presented on the 19 investigated sites at Mon Schools’ board meetings over a period of months, March-June, 2010 (see map, bottom). The architect’s final evaluation of sites consisted of three sites: the existing Woodburn schoolgrounds, the area near old UHS/new Mountaineer Middle, and a mystery location (the exact 705/119 intersection location on the Mileground that Mon Schools refused to disclose at the time). The new UHS site was never considered, to the public’s knowledge, in the architect’s site selection process. Never. In fact, the UHS site is 2 miles distant from any of the other 19 sites considered. The 19 architect-investigated sites are all within 2.5 miles of one another, at most. But the UHS site is 2 miles from the nearest of the 19 sites, and about 4.5 miles from the existing Woodburn schoolgrounds (see map, second from bottom). The UHS site is Devono’s threatened alternate site. Pictured above, as blue dots, are the Morgantown Area elementary schools. From left to right along the top line: Mylan Park, Suncrest, North, Easton (black dot on blue), Cheat Lake; from left to right along the bottom line: Skyview, Mountainview, Brookhaven. The center black dot encircled is Woodburn Elementary. The top black dot encircled, most of the way to Pennsylvania, is the new UHS site, which the superintendent threatens as the Eastwood alternate site. This brilliant idea would send the innermost city schoolchildren to the outermost Morgantown area school. Devono has latched upon the UHS site as being the one alternate to the Eastwood Mileground site ever since the beginning of the lawsuit against Devono and the Mileground site. Now he has repeatedly raised this site, never considered publicly by the architect, as the one alternate to Eastwood. Is Superintendent Frank Devono deaf and blind? Or did he sleep through the presentation of the Woodburn school model, made by architects with school design experience? A Woodburn resident demonstrated the model in a school board meeting presentation, which made clear how a school could be built on the Woodburn schoolgrounds. 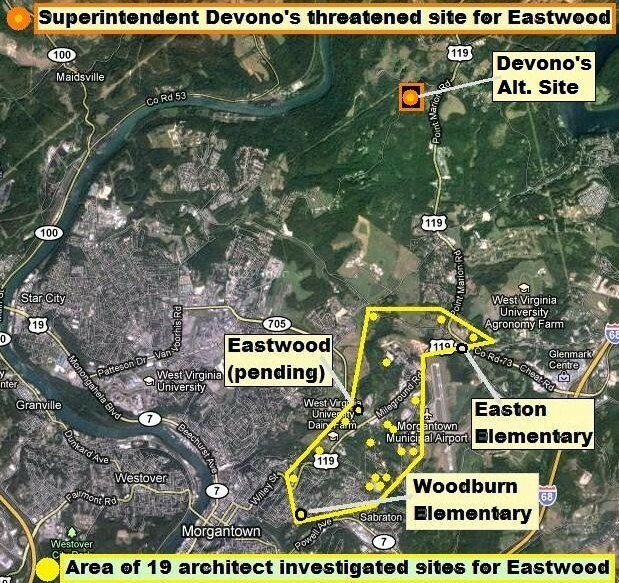 The existing Woodburn schoolgrounds site was one of the final three sites in the full “Site Selection Evaluation for the SBA Green Elementary School for the Monongalia County Board of Education and the School Building Authority of West Virginia.” Devono’s threatened site did not even make the top 19. It wasn’t considered at all. Why does superintendent Devono continue to speak in such an arbitrary and capricious manner in regard to siting? Maybe we will need another lawsuit to find out. The broad community consensus all along, which the superintendent and board have never even acknowledged, let alone tried to work to implement, is to build TWO modest-sized schools to replace Easton Elementary and Woodburn Elementary. Mon Schools could do so very efficiently and properly by building one on the existing Woodburn school grounds, and by building another on the UHS site (or some other suitable site), which would well serve the Easton catchment. The silence from Mon Schools on this most appropriate option is deafening, as it has been for many months. Concisely and strongly stated, as usual. Good job, folks.